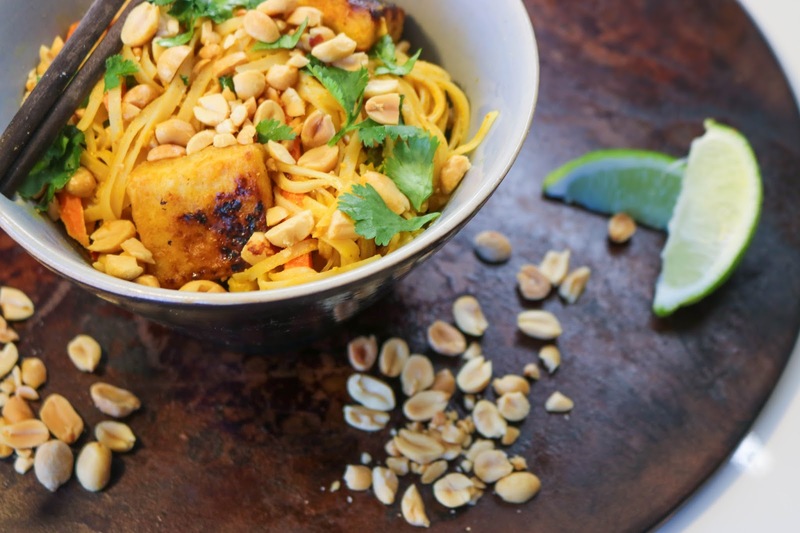 Peanut Curry Noodles. Creamy, spicy, and salty. While I most often serve hot, I've also found it is great as leftovers served cold. Top with sriracha for some extra spice. 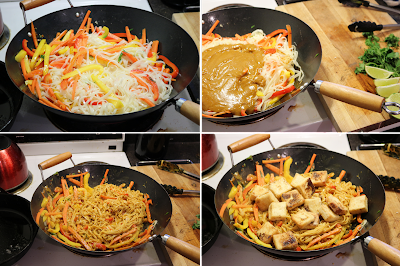 Combine peanut butter, honey, soy sauce, sriracha, rice vinegar, sesame oil and curry powder. Thin with water or vegetable broth. Cut tofu into bite-sized pieces, and toss with corn starch. Heat (med-high) oil in pan and fry tofu in batches. Salt tofu and set aside. Boil water for noodles. In the meantime, chop up bell pepper, carrots, green onion, garlic and chili pepper. Add noodles to boiling water for 5 minutes, then add ice to stop cooking. Strain. Heat oil (med-high). Cook garlic and chili for 30 seconds. Add carrots and bell peppers. Cook for 5 minutes, stirring constantly. 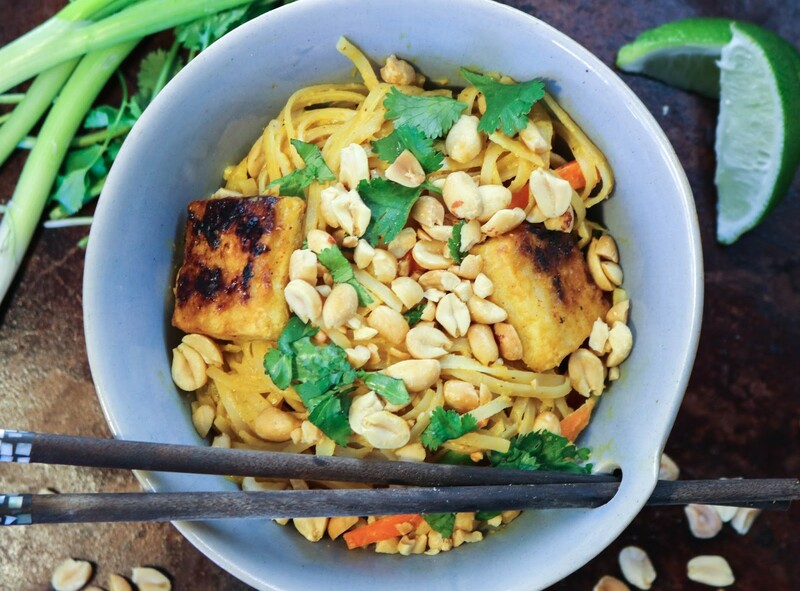 Add noodles, peanut sauce and tofu. Garnish with green onion, cilantro, crushed peanuts and a squirt of lime. 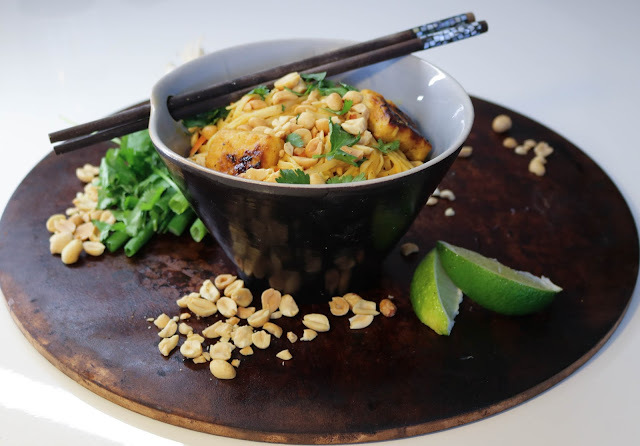 Combine ingredients for peanut sauce. Heat oil. Chop tofu into bite-sized pieces. Coat tofu in corn starch. Cook tofu in batches. Fry on each side for ~1 minute. Start boiling water for noodles. Add noodles to boiling water for 5 minutes. Stirring. Cook garlic and chili for 30 seconds. Add carrots and bell peppers. Cook for 5 minutes. Add noodles, peanut sauce, tofu and stir. eat (v.) Old English etan "to consume food, devour, consume"
food (n.) Old English foda "food, nourishment; fuel"